This pre-finished MDF engineered wood door has a realistic wood finish and creates a nice focal point in a home. Plus, the trackless design keeps floors hazard free. 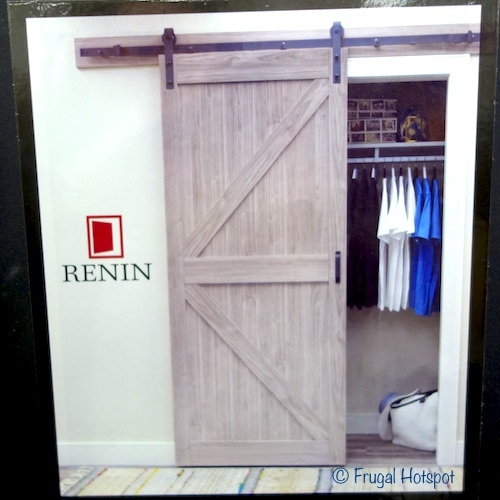 Select Costco locations have the Renin 36″ Complete Barn Door Kit on sale for $199.99 (after instant savings), now through April 14, 2019. That is $50 off Costco’s regular price of $249.99. While supplies last. Item #1209157. This door fits openings that are 28-34 inches in width and 80.5 inches in height. • Door comes pre-drilled mounting holes and bottom groove guide. • Great to use for a room divider or a closet door. • Single 78.75 inch rail to hang door is included. • The soft-close feature is pre-installed. Dimensions: 84 in. x 36 in. x 1.37 in.